In this case a generator with a rated power of at least 3108W and a maximum power output greater than 7233W would be required. Electronic appliances and brushed motors generally will not draw more than running Watts at start up. Induction motors in equipment like air conditioners, welders, water pumps and compressors can draw 2 to 5 times their running power to start. Please consult your equipment's rating label, manual or the manufacturer to confirm specific requirement. For generator selection purposes Power factor is the ratio used to calculate kVA from Watts. Power factor is noted on the generator rating label and manual. Usually this will be between 0.8 and 1. Once you’ve determined your startup and running power requirements consider what other features and accessories you need. Minimum IP53 rated sockets and are fitted with a MEN (multiple earth neutral) link. They comply with AS3012-2010 and are suitable for use on building and construction sites. Also known as “Worksafe” or “WorkCover approved” generators. Inverters produce power in a unique way to standard generators. They have an engine driving an alternator but use sophisticated electronics and magnets to produce 3-phase current which is first converted to DC and then “inverted” back to clean AC single phase power. The benefit of an inverter over standard generators is that the size and weight of inverter generators is usually smaller making them much more portable. Silent type inverter generators are specifically designed to keep noise to a minimum. Fuel efficiency and run time per litre is also better. Finally, they produce a pure sine wave which is perfect for use with sensitive electrical equipment such as TV's, laptops, tool battery chargers and other consumer electronics. A pure sine wave will have a THD% (Total harmonic distortion) under 6%. Higher THD% alternator is not recommended for sensitive electrical equipment but is perfect for simple appliances, brushed motors and tools. Standard generators can produce a pure wave <6% with additional componentry. Inverter generators produce the purest sine wave usually <3%. Diesel generators are perfect for farmers and tradesmen who want a safer fuel source, longer performance life and better fuel economy. They are also ideal for power back-up in remote locations and industrial situations. 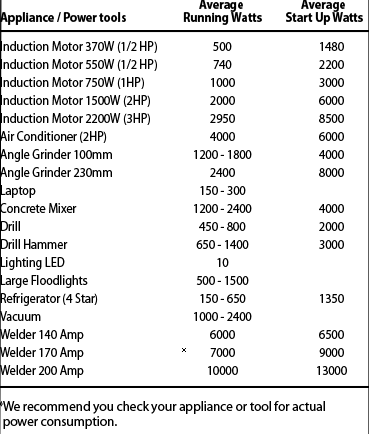 Follow the same process to select the appropriate size and featured generator for your home or worksite. You must use a licensed electrician to install the generator to use for backup power. The manual includes a wiring diagram and instructions to assist. For ease of starting you may want a generator with electric start in addition to standard recoil start. These have a lead acid battery, and they will require charging and maintenance especially if you leave the generator idle for more than a week so factor this into your purchase. If you want to turn your generator on/off from a distance up to 50m, consider a model with remote control. The engine will either warn you or shut down, depending on the model, if the oil level becomes critically low. This will prevent the generator from overheating and being damaged. The generator will run at a reduced RPM if running under full load to conserve fuel. Check the tank size and running time. If you need a full 8 hour work day running time or backup power you may need a generator with a long range tank. A 12V DC outlet with accessory lead is perfect for powering 12V devices and charging batteries. Perfect for charging phones and other small electronic devices. Requires minimal maintenance, with clean output. Either switched or electronic, this protects the generator from overheating if current draw overloads. Wheel & Handle kits - our range offer models with these as standard or as add on kits. Lifting Point - for heavier petrol models we have a lifting point either built into the design or as an add on kit. Check your work site requirements as you may need a lifting point to get your generator past OH&S requirements. Water Proof Cover - we have waterproof covers to suit silent inverter generators. Check out our SABER generator comparison chart HERE.